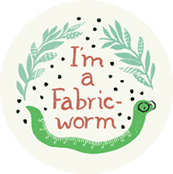 Fabricworm Tuesday Giveaway! Monaluna Beach Mod Fat Quarters! This week simply tell us what your favorite project you've done! Let us know what your favorite project has been so far! Happy Sewing! I think every new project is my favorite, but I guess my favorite thing is handbags! 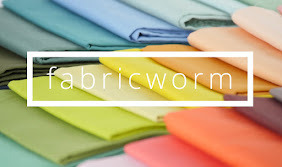 I love organinc fabric! These prints are wonderful. my first quilt was my favorite! love those fabrics. My favorite project is a quilt I made for my mom. It has the remnants of all of the Hawaiian shirts she has made herself over the last 30 years or so, as well as remnants of many of the clothing items she made for me over the years. cute mix! favorite project is an i-spy quilt - fun fabrics and I FINALLY learned how to do a binding - it wasn't hard at all! Great selection for the giveaway! Favorite project, that's easy when you only have a handful of projects done. I really love my first quilt, a sunshine and shadow pattern. I made stuffed monsters for the kids...I think I had the most fun with that project! I receive the newsletters. Thanks for the opportunity to win such great fabric. My favorite project so far has been working with my sister on handbags. It got her going on sewing, and will hopefully result in another quilter in the family I can drag to shows! This fabric is amazing!!! Thanks for the chance to win! I made a play mat with peek-a-boo flaps for my niece for Christmas. I designed it myself and was thrilled with how it turned out. My favorite project I've done so far is my mini Flea Market Fancy Quilt. 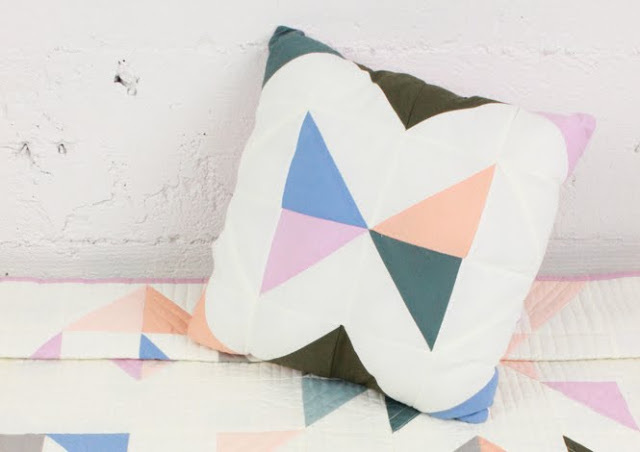 My Child of the 80s quilt made with Remix has been my favorite project. My favorite project is a quilt for my bed made out of Seaside Rose. It is organized yet scrappy looking at the same time. It really lightens up the room and we sleep under it regularly. My favorite project was taking a pattern entitled "Winter Garden" and making it in an assortment of brightly colored batiks to combat my winter blues. my favourite project is baby quilts. 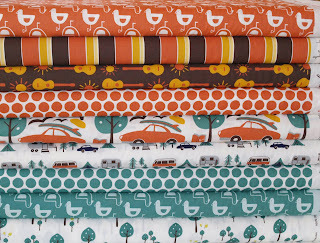 i love this fabric bundle, i already bought it from your shop but would love more:) The perfect material for camping quilts. My favorite project is probably the 1st dress I ever made my daughter, it was green with a matching hat, that was 5 years ago. 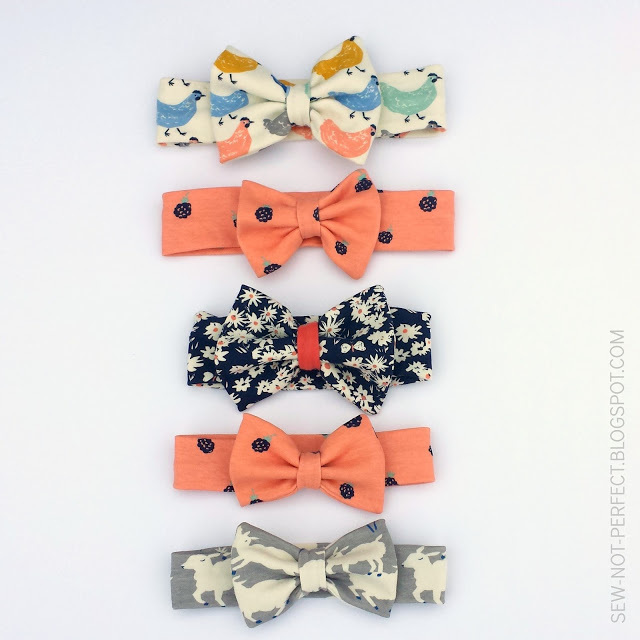 I love to make her hair accessories too! I love all of your fabric. Hope I win!! Love these fabrics! 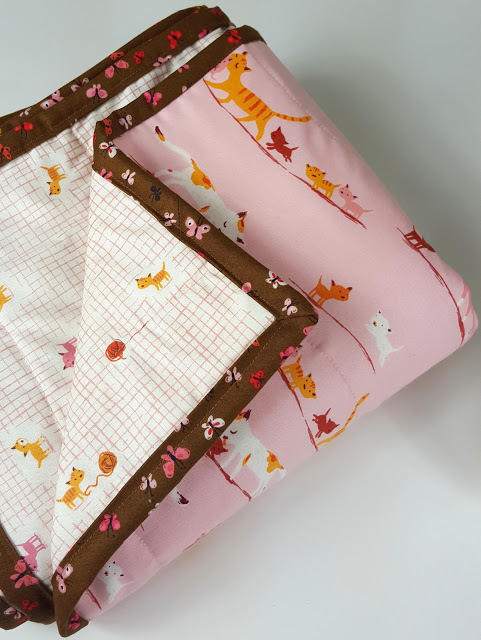 My favorite projects are the hand quilted baby quilts for my grandbabies! My favorite project so far is a crib bedding set I made for my son. Using the blues and yellows from the good folks anna maria horner collection. I still have to make the crib skirt before I post pictures!! My favorite project is a baby blanket I made for my little boy. I'm sewing up some pillowcase dresses for the charity Dress a Girl Around the world! And then a springy tablecloth for my kitchen table. I am in love with this collection. Haven't got a favorite project yet- it is usually the one I am currently working on. I just finished a quilt for my baby and I LOVE IT!!! He's due in 2 weeks and I can't wait to snuggle him up in it. My favourite project is the flower garden quilt I am working on.Slow, but ...!Thanks for the give away! just loved making my kids valentine day dolls this year! I'd love this. We're moving to NC and the patterns would make a great new bag. I think that the quilt I've just finished is my favourite...until I make the next one! I used a Me & My Sister scrappy bag and lots of scraps of white-on-white...the quilt is so fresh and very 'me'. I love curling up under it! Thanks for the giveaway! So many favorites....but my current favorite is the quilt that I just finished for Modern Quilt Guild Challenge #2, a monochromatic study. Thank you for the giveaway! My favorite project so far are tote bags. I love this fabric! It is hard to chose but I recently made a ball my son plays with all the time! I just added my name to the mailing list! Even though I'm not a clothing-maker, I'm pretty pleased with a dinosaur costume I made. Part of me wants to go back and fix the rookie mistake I wouldn't make if I were to do it now. But it's all part of learning, right? 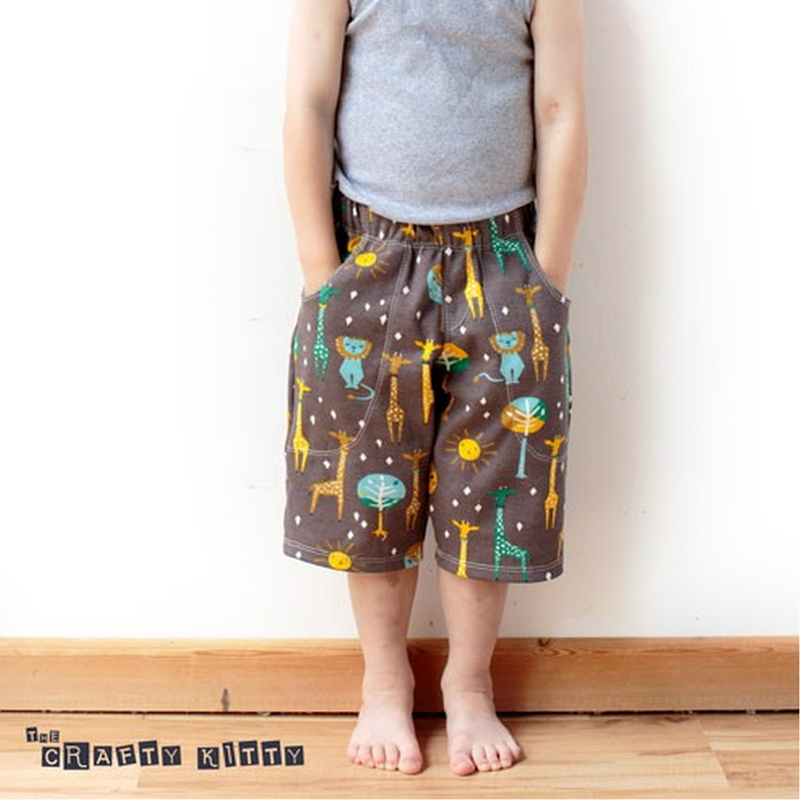 my favourites are always clothes I make for my son. It is much harder to be creative than for my girl. I finished a "teddy bear" quilt for my son's bear and I'll soon be finishing a matching quilt for him so he and his buddy can having twin quilts! I would love to get my hands on some of this fabric! Very cute!! My fave project is usually the one I've most recently finished. I just made a super cute tea cozy with some beautiful Etsuko fabric. My favorite project ever is a mei tai baby carrier that I made for my son. I'll love it even when he outgrows it! And I'm already a follower. Thanks for the great giveaway! A unicorn costume for my daughter. My fave project was a bunch of dinner napkins I just made in this gorgeous yellow floral print. So springy! I'm having Easter dinner at my house just so I have an excuse to use them! This has to be one of my favorite fabric stacks ever! So fun and would bring some sunshine to this cold New England spring. This week I made some cute coffee cozies and mini quilt top! I made a knitting needle rollup for a friend that was really cute and also very functional! 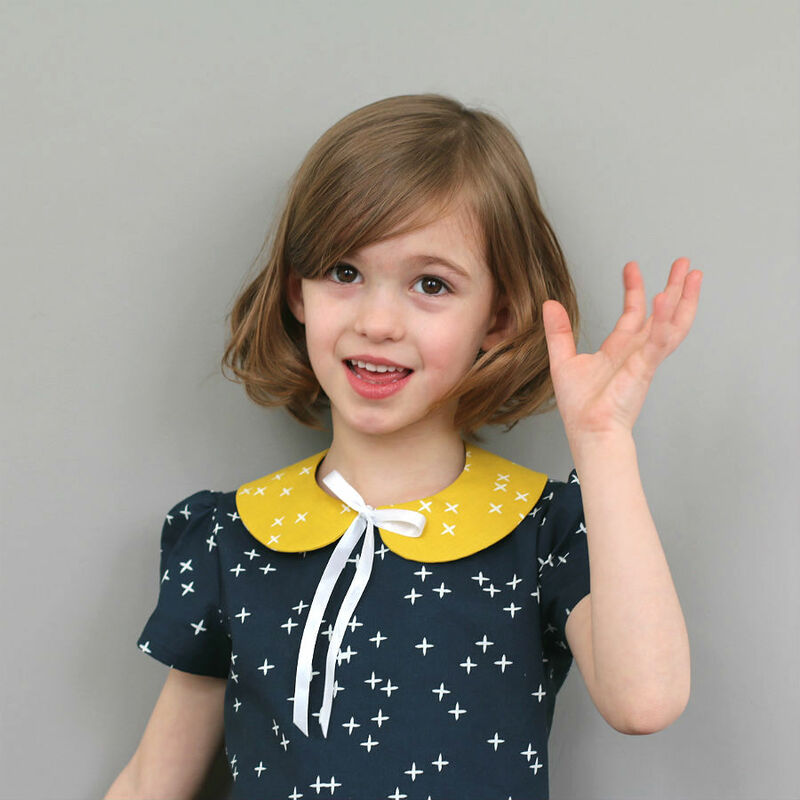 I recently made my girls each the Gracie dress with the Alexander Henry Storybook fabric which they just love. These are probably my favorites since they love them so much. My favorite project this year (so far) was a sofa-sized tumbler quilt. My favorite project is probably the central park postage stamp quilt that I did earlier this year. so very fun. Probably, a pillow case dress for my daughter. I love making things for her. LOVE love love the orange and blue together!! My fav project is always whatever I've finished most recently! My favourite project so far has been two cot quilts for my twin girls, machine pieced and hand quilted. I used a Snippets jelly roll and white sashing. My favorite project has to be the Waldorf doll and doll clothes I made my little girl. Oh, and I am on your mailing list. Hmmm... Favorite project. That would have to be the quilts that I have made for my niece's. Just signed up for your newsletter - I think I already get it but I can't remember forsure. 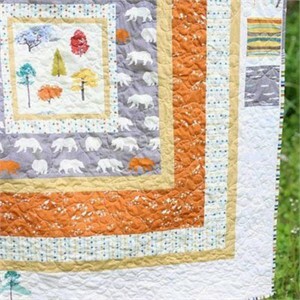 my favorite project is a baby quilt I made for my nephew - so soft and cozy, sigh! My favorite thing that I have made so far is the nursery decor for our third boy. Just simple curtains, crib skirt and several sheets, but I love it. Thanks! On the mailing list! Thanks! my favorite project that i have done so far is pants for my little girl. so cute! My favorite project I have done is the fall quilt on our bed. Oh, great giveaway! 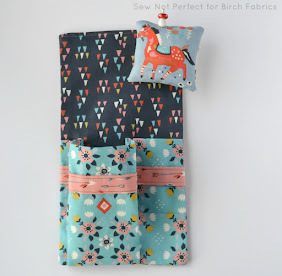 I've totally been eying this fabric to make a quilt for a friend whose baby is due soon! My favorite project I've ever made is either my first Amy Butler Birdie Sling or the quilt I'm working on right now (Heather Ross Mendocino fabric mixed with some other yellows and browns). My dogs wearing shoes quilt is my favorite. Oh I love these patterns! I used the orange dots recently to do a baby quilt! My first quilt which was made from monaluna fabric with the rocket ships! Would be great to win. Thanks! My favorit project was a colourfull, big but cute monster for my little cute nephew. Making a quilt for my first niece, priceless! 70's I sewed pastel squares together to make a long wrap around shirt. It is now a favorite of my daughter to wear. I'm in.. i love the ducks, the gitars and carfabric! These fabrics are wonderful and will make a great project!! My favorite project, so far, has been making a shirred dress for my daughter (and a matching one for her cousin). Thanks for the giveaway opportunity! Oh I have been drooling over this collection for along time!!! Anyway, my favorite project has been a quilt for my future daughter in law in Paso Robles...I made her a quilt with Authentic. It was so hard to mail....but it got there! 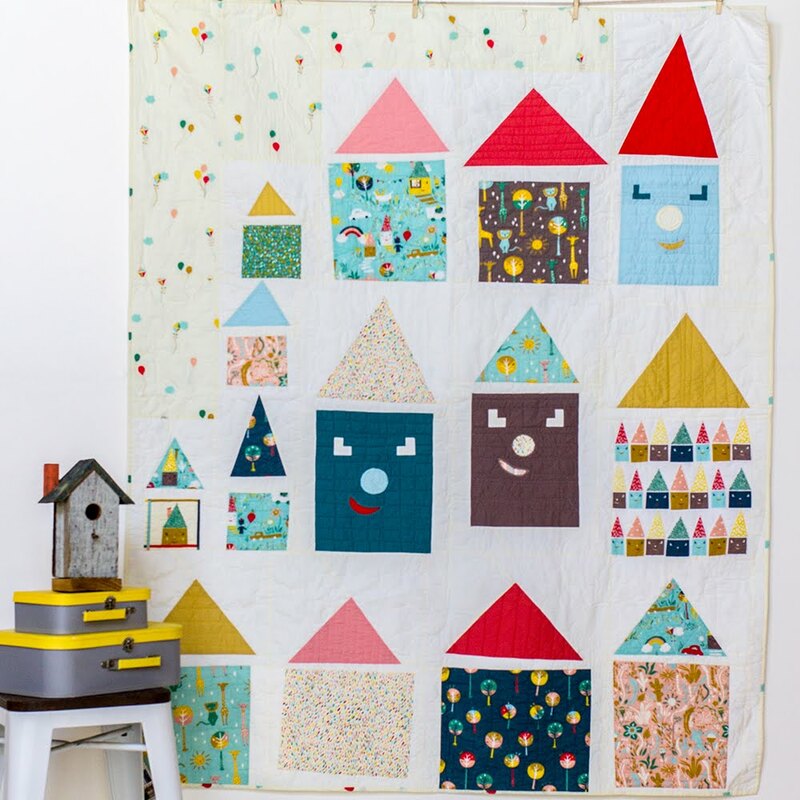 My favourite project has been my first baby quilt - a disappearing 9 patch in Cloud 9's gorgeous My Happy Garden organic fabrics. 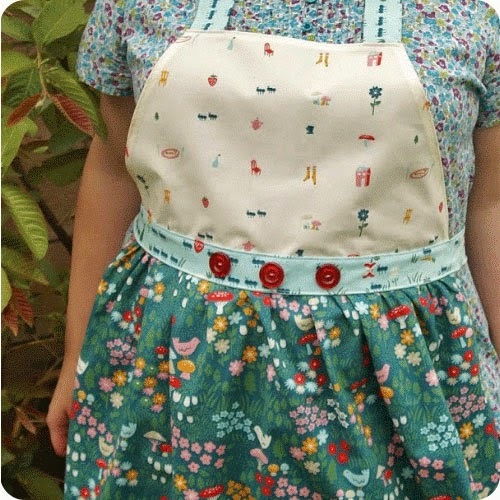 My favorite project has been making an apron for a little girl. 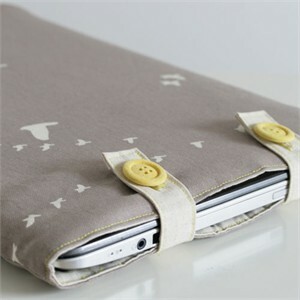 The fabrics were super cute, and the variety that I used really added a hip, modern element to it. My favorite project has been a little girl's apron. My favorite project is the swap quilt I just finished for DQS10. It is Hope Valley mini interlocking whirly gigs that are hand quilted! My favorite project was a little girl's apron. I've posted on FB about your giveaway on my ShortysSutures page! i recently finished my newborn son's baby quilt. i love it and him! 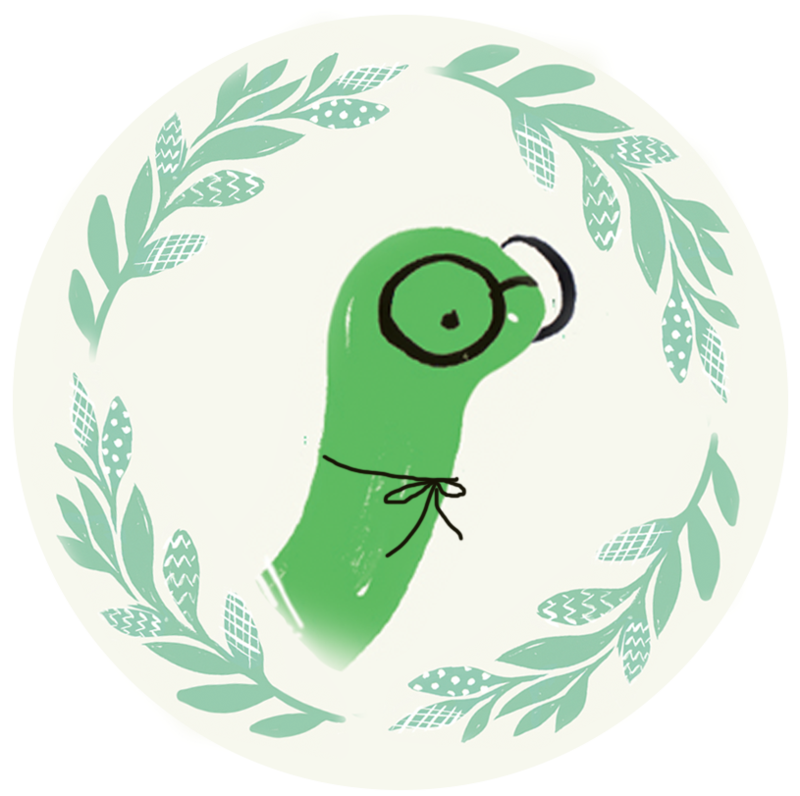 I just tweeted about the FabricWorm giveaway and my name is Mary on Lake Pulaski on Twitter. 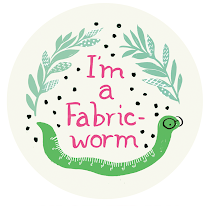 I have already signed up and receive the FabricWorm newsletter! I'm working on a 3D pattern right now that's pretty darn cool! 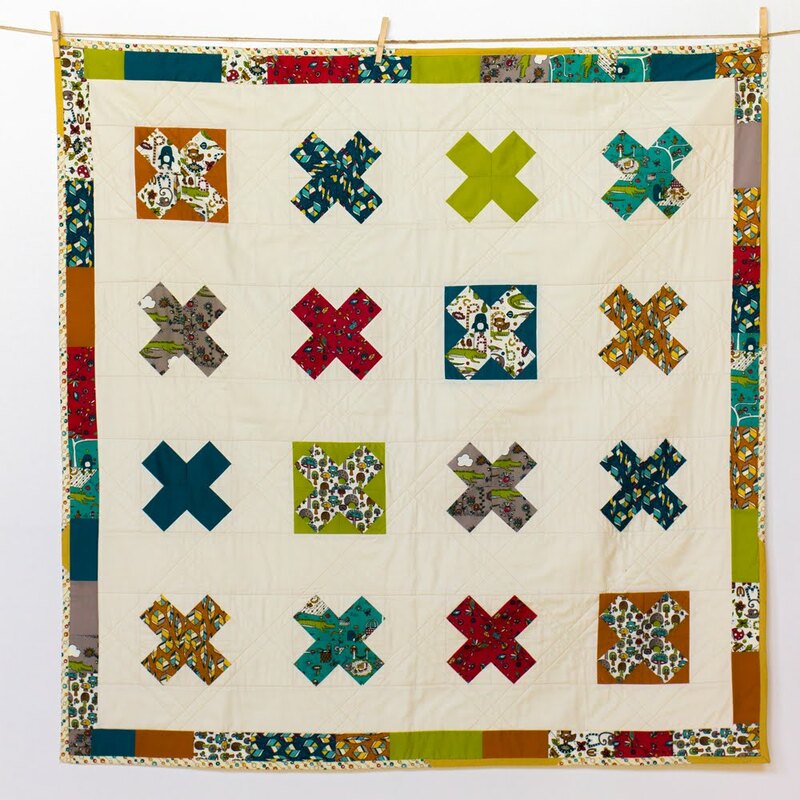 My favorite project was a windmill quilt that I made with reproduction fabrics I bought while on vacation in Amsterdam. It makes me happy every time I look at it! Awesome fabric!! I love the little cars!!! Just signed up for the newsletter....although I thought I already was, but did it again anyway!! My first quilt! I've made many since then, but my first will always be my favorite. At the moment my favorite project is a pinafore shirt I just finished for my daughter. My favorite project recently has been my 1800's silhouette pillows! 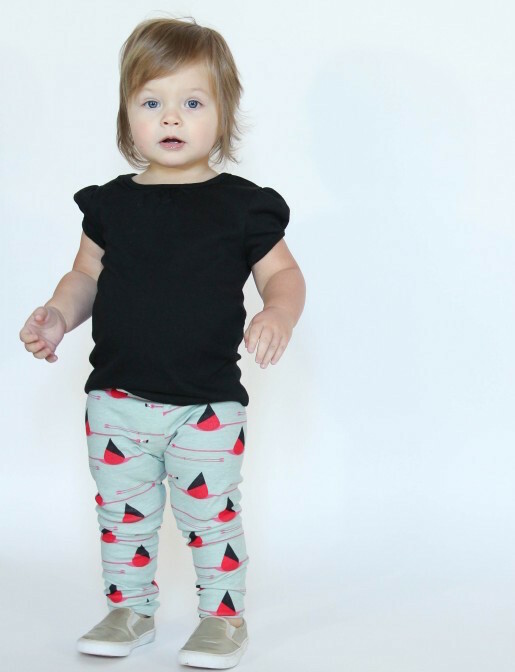 I love making my kids clothes! My favorite project recently has been my 1800s silhouette pillows! My favourite project is the crib quilt I made for number 2 son from scraps of baby wraps. I just finished a super quick and super cute diaper bag. Yeah for instant gratification! Cute! 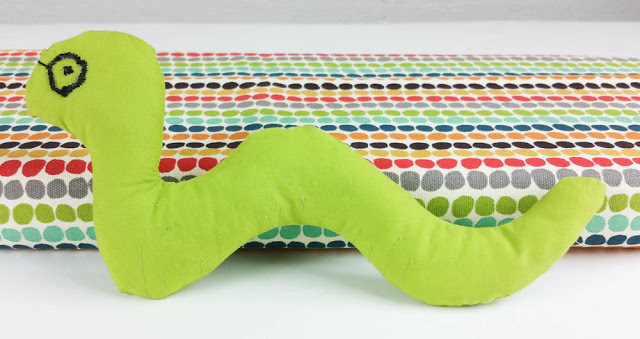 My favorite project is the pillow seats I made for the kids using one of Amy Butler's patterns. They turned out wonderfully! My favorite project I have made is a Dr. Seuss quilt for my new son! Thanks for the chance at winning the cute fabrics! OMG!! I absolutely love that fabric....wish I could buy it by the bolts!! Like Like!! I'm most proud of things I use often like the baby quilt I made for #2. My current favorite is the Wall-E quilt I am working on for my daughter. I made the design/pattern myself and it is my first time trying to applique. I love how it is turning out and really want to make more quilts! Working making toddler dresses! they all ahve crazy pockets, nad my girl loves her pockets! 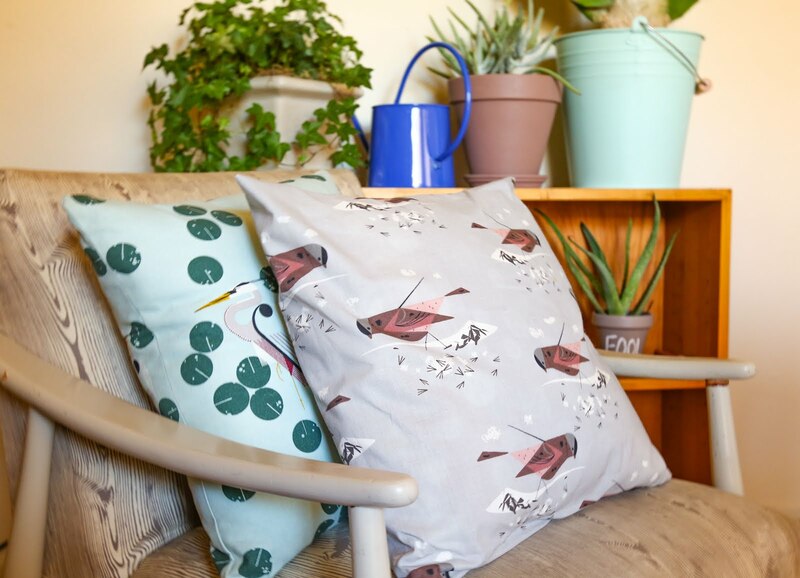 My favorite is Amy Butler Birdie Bag! my favorite so far: pieced linen pillows, with zipper closures. nothing fancy, but exactly what i wanted (plus i'm very new to sewing, so every finished project is a little victory). thanks for the chance! I just tweeted ( twittered??) and I'm BaileyGirl_5 on there too. 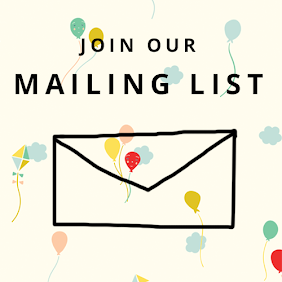 I'm already on your mailing list!! I've been wanting this bundle! My favorite projects are always dresses for my daughter. 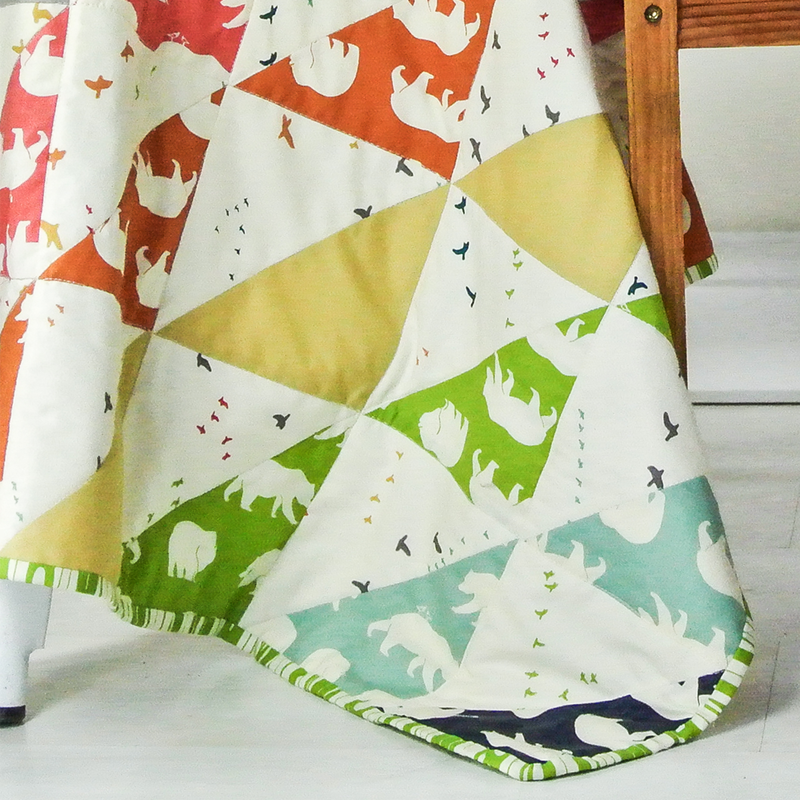 My favorite project was a toddler quilt with a quilt-along and some beautiful fabric for my daughter. It was my first time quilting a minky backing and doing a scallop edge. That quilt has some imperfections but I LOVE it! My favorite is a tie between the first quilt I ever made and the travel bags I made for my kids this past summer. Hmm. All time favorite project? Has to be my christmas poinsettia quilt. Thanks for the fun chance! After not doing any quilting for over 25 years, I just finished a wedding quilt for my nephew and can't wait to get going on more! So many favorites, it's too hard to pick. Love the fabrics! my fav project - tshirt quilt. already signed up on mailing list. Just joined the list, too. Super cute! I love these prints. 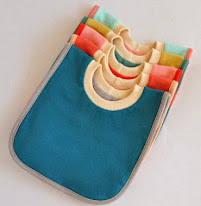 My favorite project is shopping bags - practical, cute & easy! Lovely collection! My favorite project so far? My single girl, though it's on hiatus until we move. i'm making our wedding quilt right now that will be used as backdrop for the DIY photo booth. it's not yet done but i'm already in love! But sometimes EVERY new project I start is a favorite! 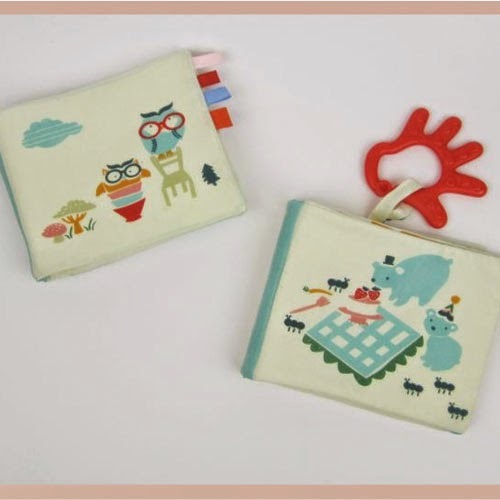 Very cute fabric line....I would love to win! Thanks for the chance. my favorite project is the one i am working on now, an Amy Butler Raincoat made with laminated fabric. So fun! let's try that again when I am actually signed in! I tweeted it. Or is that twittered it? Those are earth colors great .